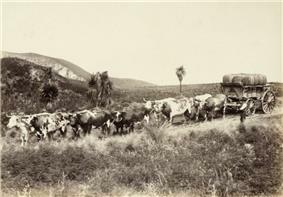 A bullock wagon team taking wool from a farm station. 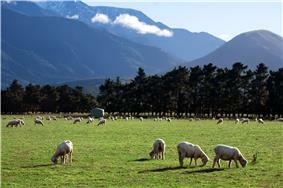 The number of sheep in New Zealand peaked in the 1980s and is now reducing due to lower profits. Agriculture in New Zealand is the largest sector of the tradable economy, contributing about two-thirds of exported goods in 2006-7. For the year ended March 2002, agricultural exports were valued at over $14.8 billion. The New Zealand agricultural sector is unique in being the only developed country to be totally exposed to the international markets since subsidies, tax concessions and price supports were removed in the 1980s. Pastoral farming is the major land use but there are increases in land area devoted to horticulture. New Zealand is a member of the Cairns Group which is seeking to have free trade in agricultural goods. The government offered a number of subsidies during the 1970s to assist farmers after the United Kingdom joined the European Economic Community and by the early 1980s government support provided some farmers with 40 percent of their income. In 1984 the Labour government ended all farm subsidies, and by 1990 the agricultural industry became the most deregulated sector in New Zealand. To stay competitive in the heavily subsidised European and US markets New Zealand farmers had to increase the efficiency of their operations. Animal farming is pasture based, cows and sheep are rarely housed or fed large quantities of grain, with most farmers using grass based supplements such as hay and silage during feed shortages. Pigs are usually kept indoors, either in gestation crates, farrowing crates, fattening pens, or group housing. In Northland, the major form of pastoral farming is beef cattle. In the Waikato and Taranaki areas, dairy cattle predominate. Through the rest of New Zealand, sheep farming is the major rural activity, with beef cattle farming in the hills and high country, and dairying increasing in Canterbury, Otago and Southland. New Zealand is the world's eighth largest milk producer, with about 2.2% of world production. Total production was 1.3 billion kg of milk solids, and NZD 8.38 billion of dairy products were exported in the year ending 30 September 2007. There are approximately 4.2 million dairy milking cows in New Zealand, and 5.26 million dairy cattle in total at 30 June 2007, an increase from 3 million in 1982. In mid-2005, there were 12,786 dairy farms, with a total area of 2.1 million hectares. Traditional dairy production areas are the wetter areas of the country: Waikato, Taranaki, Southland, Northland, Horowhenua, Manawatu and Westland. Fonterra is the major processor of milk in New Zealand. It processes 94.8 percent of all milk solids from dairy farms. Other large dairy companies are Tatua Co-operative Dairy Company, Westland Milk Products and Synlait. Livestock is predominantly grass-fed, but hay and silage is used in the winter months to make up for slower pasture growth. 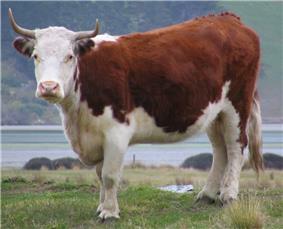 There were 38.5 million sheep and 4.39 million beef cattle in New Zealand in June 2007. The number of sheep saw a substantial fall from the 70.3 million in 1982, while beef cattle numbers declined by about ten percent over the same period. In June 2006. 573,000 tonnes of sheep meat was produced in 2006-7, and 164,000 tonnes of clean wool. NZD 2.08 billion of lamb, NZD 283 million of mutton, and NZD 938 million of raw wool and wool products was exported in the year ending 30 September 2007. Production of beef and veal in 2006-7 was 623,000 tonnes, with NZD 1.64 billion in exports. There were 13,254 beef farms, 13,905 sheep farms and 1,614 mixed beef/sheep farms in 2005, with areas of 1.5 million hectares, 8.1 million hectares, and 655,000 hectares respectively. Deer farming has increased dramatically from a herd of 150,000 in 1982 to 1.59 million in 2006, with 1,617 deer farms occupying 218,000 hectares of land in 2005. NZD 252 million of venison was exported in the year ending 30 September 2007. New Zealand is the largest exporter of farmed venison in the world. In the 1970s and 80s there was a huge industry carrying out live deer recovery from forested areas of New Zealand. The deer are a pest animal that has a negative impact on the biodiversity of New Zealand. The deer-farm stock was bred from the recovered wild animals. In 2005, there were 264 pig farms with a total area of 12,831 hectares. There were also 855 mixed livestock farms and 633 other livestock farms, with areas of 178 and 18,000 hectares, respectively. The 50,000 tonnes of pork produced in 2007 was supplemented by 40,000 tonnes of imported pork products to meet domestic demand. 14.7 million chickens were raised for meat in 2007, with 145 tonnes of chicken meat produced. No other poultry is raised in significant numbers in New Zealand. Approximately 3.1 million laying hens are kept, producing 900 million eggs in 2006. Goats are also farmed for meat, milk, and mohair, and to control weeds. Milling of New Zealand's extensive native forests was one of the earliest industries in the settlement of the country. The long, straight hardwood from the kauri was ideal for ship masts and spars. As the new colony was established, timber was the most common building material, and vast areas of native forest were cleared. Rimu, tōtara, matai, and miro were the favoured timbers. The Monterrey Pine, Pinus radiata was introduced to New Zealand in the 1850s. It thrived in the conditions, reaching maturity in 28 years, much faster than in its native California. It was found to grow well in the infertile acidic soil of the volcanic plateau, where attempts at agriculture had failed. The Government initiated planting of exotic forests in 1899 at Whakarewarewa, near Rotorua. This was to address growing timber shortages as slow-growing native forests were exhausted. In the 1930s, vast areas of land were planted in Pinus radiata by relief workers. The largest tract was the 188,000-hectare Kāingaroa forest, the largest plantation forest in the world. As the major forests matured, processing industries such as the Kinleith Mill at Tokoroa and the Tasman Mill at Kawerau were established. Plantation forests of various sizes can now be found in all regions of New Zealand except Central Otago and Fiordland. In 2006 their total area was 1.8 million hectares, with 89% in Pinus radiata and 5% in Douglas fir (Pseudotsuga menziesii) Log harvesting in 2006 was 18.8 million m3, down from 22.5 million m3 in 2003. This is projected to rise as high as 30 million m3 as newer forests mature. The value of all forestry exports (logs, chips, sawn timber, panels and paper products) for the year ended 31 March 2006 was $NZ 3.62 billion. This is projected to rise to $4.65 billion by 2011. Australia accounts for just over 25% of export value, mostly paper products, followed by Japan, South Korea, China and the United States. Within the New Zealand economy, forestry accounts for approximately 4% of national GDP. On the global stage, the New Zealand forestry industry is a relatively small contributor in terms of production, accounting for 1% of global wood supply for industrial purposes. There are about 400 growers of stone fruit who utilise 3000 hectares of land, mostly in the Hawke's Bay and Otago regions. Three quarters of the fruit produced is consumed domestically. Peaches, nectarines and plums are produced for domestic consumption, and apricots and cherries, almost all from Otago, are exported. About 30 varieties of apples and pears are exported, with over 16 million tray carton equivalents (18 kg) of apples and 300,000 tce's of pears exported in 2007. 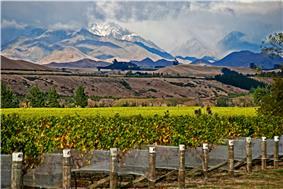 Most pipfruit is grown in the Hawke's Bay and Tasman regions, with about 10,000 hectares planted. Kiwifruit is grown in many regions of the North Island and in the north of the South Island, but is most concentrated in the Bay of Plenty. There are 2,700 kiwifruit growers, with over 13,000 hectares planted. Over 80 million trays of kiwifruit were exported in 2006, about one-quarter of the world's production. Kiwifruit is New Zealand's largest horticultural export by value. In 2007 there were over 29,0000 hectares planted in grapes (mostly in Marlborough, Hawke's Bay and Gisborne), 205,000 tonnes of grapes were produced, and there were 543 wineries. Citrus fruit is grown in Gisborne, Northland and Auckland. Blackcurrants and other berry fruits are grown in Tasman, Waikato, Canterbury and Auckland. Avocados and other subtropical fruits are grown in Northland and the Bay of Plenty. Total exports of fresh fruit were worth NZD 1,200 million in 2007, and NZD 105 million of processed fruit was also exported. 76 million litres of wine, worth NZD 698 million, was exported. Almost all hay and silage is consumed on the same farm as it is produced. Most supplementary feed crops are grown in the South Island, where the colder climate forces additional feeding of stock during winter. Wheat is mostly grown in the Canterbury region and is used for domestic consumption in bread and biscuits. By-products are bran and pollard, which are used for stock feed. Barley is used for stock feed and for malt. Some barley is exported, depending on international price fluctuations. Maize is grown in the Waikato and Manawatu-Wanganui regions as feed for chickens, pigs and cattle. Oats are grown in Canterbury and Southland for animal feed, and for rolled oats and oatmeal. Vegetable growing occupies more than 50,000 hectares of land and employs 25,000 people. More than 50 different vegetables are grown in New Zealand. Approximately 1,450 growers produce fresh vegetables with a value of over NZD 400 million in 2007. NZD 260 million of fresh vegetables, mainly onions and squash, were exported in 2007. 750 growers produce vegetables worth over NZD 100 million for processing, and NZD 297 of processed and frozen vegetables, mostly potatoes, sweetcorn and peas, were exported in 2007. NZD 63 million worth of seeds and bulbs, and NZD 43 million of cut flowers and foliage, were exported in 2007. 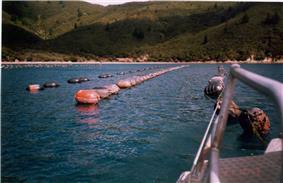 Aquaculture started in New Zealand in the late 1960s and is dominated by mussels, oysters and salmon. In 2007, aquaculture generated about NZ$360 million in sales on an area of 7,700 hectares with a total of $240 million earned in exports. In 2006, the aquaculture industry in New Zealand developed a strategy aimed at achieving a sustainable annual billion NZ dollar business by 2025. In 2007, the government reacted by offering more support to the growing industry. New Zealand had 2,602 beekeepers at the end of 2007, who owned 313,399 hives. Total honey production was 9700 tonnes. Pollen, beeswax, and propolis are also produced. Beekeepers provide pollination services to horticulturalists, which generates more income than the products of bee culture. Approximately 20–25,000 queen bees, and 20 tonnes of packaged bees (which include worker bees and a queen) are exported live each year. Both the original Māori people and the European colonists made huge changes to New Zealand over a relatively short time. Māori burned forest to flush out game and to encourage the growth of bracken fern, which was used as a food source, and practised agriculture using plants they brought from tropical Polynesia. The Europeans logged and burned off a third of the forest cover to convert land to pastoral farming. ^ Sarah Brazil, ed. (2008). New Zealand Official Yearbook. Statistics New Zealand. p. 357. . The export figure includes agriculture, horticulture and forestry. ^ Brendan Hutching, ed. (2006). New Zealand Official Yearbook. Statistics New Zealand. p. 359. ^ Nightingale, Tony (March 2009). "Government and agriculture – Subsidies and changing markets, 1946–1983". Te Ara – the Encyclopedia of New Zealand. Retrieved 22 January 2011. ^ Pickford, John (October 2004). "New Zealand's hardy farm spirit". BBC news. ^ Edwards, Chris; DeHaven, Tad (March 2002). "Save the Farms – End the Subsidies". ^ Nightingale, Tony (June 2010). "Government and agriculture – Deregulation and environmental regulations, 1984 onwards". Te Ara – the Encyclopedia of New Zealand. Retrieved 22 January 2011. ^ Arnold, Wayne (August 2007). "Surviving Without Subsidies". The New York Times. ^ St Clair, Tony (July 2002). "Farming without subsidies – a better way: Why New Zealand agriculture is a world leader". ^ "Animal Welfare". NZ Pork Board. June 2010. Archived from the original on 20 January 2010. Retrieved 23 February 2010. ^ "Situation and outlook for New Zealand agriculture and forestry (August 2007)". Ministry of Agriculture and Forestry. August 2008. Retrieved 2 April 2009. ^ McKinnon, Malcolm (20 December 2010). "Volcanic Plateau region". Te Ara - the Encyclopedia of New Zealand. Retrieved 4 November 2012. ^ a b "Situation and outlook for New Zealand agriculture and forestry". NZ Ministry of Agriculture and Forestry. August 2007. Retrieved 1 April 2009. ^ "The Forestry Industry in New Zealand". Ministry of Agriculture and Forestry. Archived from the original on 26 March 2009. Retrieved 16 March 2009. ^ Leaman, Aaron; Neems, Jeff (29 August 2009). "Acting 'too late' costs farmers $90k". ^ "Images: Farmers Fart Tax Protest At Parliament". scoop.co.nz. 4 September 2003. Retrieved 1 April 2009. ^ "The use of 1080 for pest control – 3.1 Possums as reservoirs of bovine tuberculosis". 2011. ^ "Dr Paul Livingstone letter to the editor". Gisborne Herald, 26 May 2011. ^ Taylor, Rowan (1997). Ian Smith, ed. The State of New Zealand's Environment 1997. Wellington: Ministry for the Environment. ^ "Water Conservation Orders Have No Role In Sustainable Future" (Press release). Irrigation NZ. 13 August 2012. Retrieved 13 August 2012. Number 8 wire is used for fencing and has become part of the cultural lexicon. It is used for all manner of tasks and it describes the do it yourself mentality of New Zealanders. The gumboot, a waterproof boot commonly used by farmers and others, is a cultural icon with Taihape hosting an annual Gumboot Day. Fred Dagg, a comedy character created by John Clarke was a stereotypical farmer wearing a black singlet, shorts and gumboots. Country Calendar is a factual television programme about farming methods and country life, and is watched by both rural and urban New Zealanders. The show first premièred on 6 March 1966, and is the country's longest-running locally-made television series. Rural New Zealand has had an impact on the culture of New Zealand. AgResearch Ltd (New Zealand's largest Crown Research Institute) believes that new technologies will allow New Zealand farmers to double their output by 2020, while simultaneously reducing greenhouse-gas emissions and other detrimental environmental impacts associated with farming practices. There are two main views on the immediate future of New Zealand agriculture. One is that, due to fast-rising consumer demand in India and China, the world is entering a golden age for commodities, and New Zealand is well placed to take advantage of this. The other view is that New Zealand will only gain limited rewards from this boom because of increasing production competition from developing countries. For New Zealand to remain competitive, farmers will either have to intensify production to remain commodity producers (increasing stock and fertiliser per hectare) or, instead, become producers of higher value, more customised products. Irrigation New Zealand is the national body representing farmers who use irrigation and the irrigation industry. It opposes Water conservation orders. The New Zealand Young Farmers is a national organisation formed in 1927 with regional clubs throughout the country. It runs the annual Young Farmer Contest. The Soil & Health Association of New Zealand, established in 1941, promotes organic food and farming. Federated Farmers is a large and influential lobby group that represents farmers interests. It has a voluntary membership which stands at over 26,000. The Ministry for Primary Industries is the government agency responsible for the agricultural sector. It has both policy and operational arms. A fixture in many rural towns is the annual Agricultural and Pastoral (A&P) shows where competitions are held for the best livestock and farm produce. Carnivals, sideshows, equestrian events and craft competitions are also held as part of the A&P shows. Many areas of the high country of the South Island were set up as large sheep and cattle stations in the late 19th century. Much of this land was leased from The Crown but after the passing of the Crown Pastoral Land Act 1998 the leases were reviewed. Environmentalists and academics raised concerns about the process saying that farmers were gaining an advantage and that conservation issues were not being resolved. There have been no outbreaks of foot-and-mouth disease in New Zealand. If an outbreak did occur there is potential for severe economic losses given that agricultural exports are a large segment of exports. New Zealand has strict biosecurity  measures in place to prevent the introduction of unwanted pests and diseases. Because of its geographical isolation New Zealand is free of some pest and diseases that are problematic for agricultural production in other countries. With a high level of international trade and large numbers of inbound tourists biosecurity is of great importance since new any pest or diseases brought into the country could potentially have a huge effect on the economy of New Zealand. Other serious pasture and crop land plant pest are nodding thistle (Carduus nutans), Californian thistle (Cirsium arvense), ragwort (Senecio jacobaea), broom (Cytisus scoparius), giant buttercup (Ranunculus acris), fat-hen (Chenopodium album), willow weed (Polygonum persicaria), and hawkweed (Hieracium species). Gorse was introduced as a hedgerow plant but has become the most expensive agricultural plant pest costing millions of dollars in efforts to control its spread over farmland. The introduced Canada Geese became prolific and began to adversely affect pastures and crops. In 2011 restrictions on hunting them were dropped to allow them to be culled. That possums are such effective transmitters of TB appears to be facilitated by their behaviour once they succumb to the disease. Terminally ill TB possums will show increasingly erratic behaviour, such as venturing out during the daytime to get enough food to eat, and seeking out buildings in which to keep warm. As a consequence they may wander onto paddocks, where they naturally attract the attention of inquisitive cattle and deer. This behaviour has been captured on video. From 1979–1984, possum control was stopped due to lack of funding. In spite of regular and frequent TB testing of cattle herds, the number of infected herds snowballed and continued to increase until 1994. The area of New Zealand where there were TB wild animals expanded from about 10 to 40 per cent. The Common Brushtail Possum was introduced from Australia to establish a fur trade. It soon became one of New Zealand's most problematic invasive species because of the huge effect on the biodiversity of New Zealand as well affecting agricultural production since it is a vector for Bovine tuberculosis. The disease now endemic in possums across approximately 38 per cent of New Zealand (known as ‘vector risk areas’). In these areas, nearly 70 per cent of new herd infections can be traced back to possums or ferrets. The Biosecurity Act 1993, which established a National Pest Management Strategy, is the legislation behind control of the disease in New Zealand. The Animal Health Board (AHB) operates a nationwide programme of cattle testing and possum control with the goal of eradicating M. bovis from wild vector species across 2.5 million hectares – or one quarter – of New Zealand’s at-risk areas by 2026 and, eventually, eradicating the disease entirely. Almost half of the greenhouse gas emissions in New Zealand are due to the agricultural sector. A portion of this is due to methane from belching ruminants. An agricultural emissions research levy was proposed, quickly becoming known as the "Fart Tax". The proposed levy encountered opposition from the farming sector and the National Party, resulting in plans for the levy being abandoned. The Pastoral Greenhouse Gas Research Consortium was formed as an alternative to imposing the levy on farmers. In 2004 the Parliamentary Commissioner for the Environment released a report on the environmental effects of farming in New Zealand. 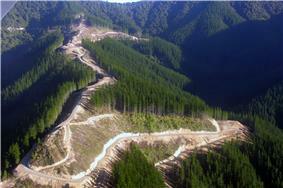 It noted that the trend was towards an increasing pressure on New Zealand's natural capital. Between 1994 and 2002 the number of dairy cows increased by 34% and the land area used grew by just 12% resulting in a more intensive land use. In the same period synthetic fertiliser use across all sectors grew by 21% and urea use grew by 160%.